The announcement provoked an angry backlash from customers and community leaders last night amid fears the region’s economy and tourism industry will be damaged. Dufftown will lose its only bank and the branches at Keith and Lossiemouth will also shut. The announcement was made just days after RBS revealed it was to axe five of its offices in the Highlands and islands. The branches at Lybster, Invergordon and Lochinver, as well as at Stromness in Orkney and Brae in Shetland are all among 65 across the UK which will close their doors. RBS said number of transactions at the three Moray branches had dropped by an average of 27% in the last four years, and just 109 people currently visit the offices regularly on a weekly basis. The company said all local closures could be offset by online and mobile banking, and that its ATM services in Dufftown would be retained. However, the decision was greeted with anger by local residents and community leaders last night. Lydia Williamson, 55, of Dufftown, said: “We have the bank shutting down, the paper shop and the post office. “It’s going to affect the local economy and it’s not very good for the community. Speyside Glenlivet councillor Pearl Paul said: “I am shocked by this decision, which leaves people in Dufftown high and dry. 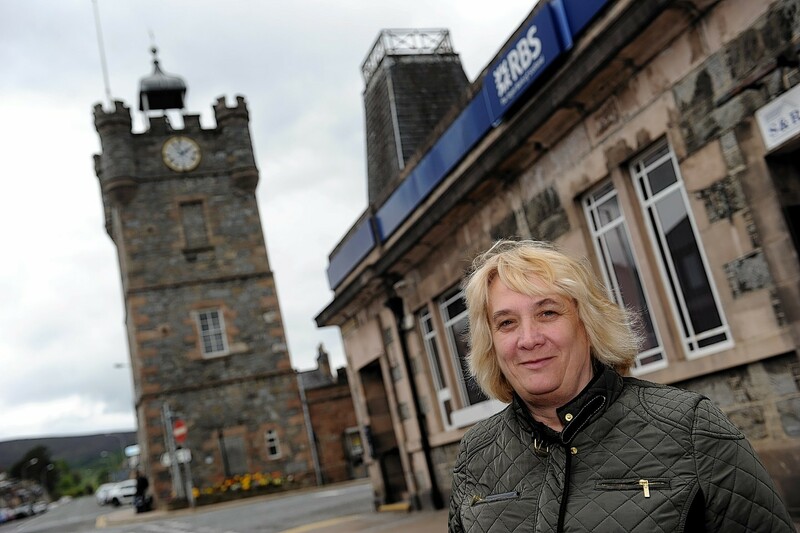 “If a solution to the recent Post Office temporary closure is not found soon then this further announcement by RBS will leave no over-the-counter banking service in Dufftown and that is very, very worrying. “It will make it very difficult in particular for older folk and people without transport to access banking services. Keith councillor Gary Coull said: “The closure of the RBS branch in Keith will be a major inconvenience for customers. And the region’s MSP Richard Lochhead described the news as a “massive blow” to employees and customers. Mary Alexander, deputy Scottish secretary of the Unite trade union, said: “These ongoing closures make a mockery of the RBS motto ‘making everyday banking easy’. An RBS spokeswoman said: “Our customers are increasingly using alternative ways to bank, such as online and mobile banking. “As a result, branch transactions have declined by around 36% since 2010 whilst online and mobile transactions have grown by more than 300%. “We have reached an agreement with the local post offices, which is close to the branches, so that our customers can check their balance, deposit and withdraw funds, and business customers can get coinage. Lossiemouth’s branch will close on September 1, RBS Keith will close on September 2 and the Dufftown branch will close on September 15.